Just as I turned on my computer to write this the transit report came on. The young woman on NY1 announced that there were delays on the downtown F train. I planned to write about the recent spate of subway delays and deteriorating service, but finding out there was a new, current problem just drove the point home for me. I just watched Lauren Scala of NBC news talk about how there are delays and service changes on the 1, 2, 3, and F trains. She did not elaborate. NYC transit doesn’t do much to elaborate either, and we all stand around wondering whether the next scheduled train will arrive or not. I’m just going to lay out what I myself experienced in the past month on the subway system. On Sundays I go to a self help group on the Lower East Side, and I take the D train from 145th Street to Broadway-Lafayette Street and change for an F train. The group starts at 6 and the ride to Second Avenue takes 40 minutes, provided that the F train is on schedule. I think once in the past five months since we moved up here was that the case. So I’ve learned to give myself an extra 20 minutes, the average wait time for an F train at the Broadway-Lafayette station on a Sunday at 5:30 PM. All to go one stop, to Second Avenue. I saw this train at Second Ave a couple of months ago. I couldn’t decide if it was a ghost or a mistake. Two Sundays ago, March 8th, I left extra early, I was at Broadway-Lafayette at 5:20, and I figured I’d catch the F train I usually missed by a minute or so. I was doing the Thursday NYT crossword puzzle on the train on the way down, and I was halfway through when I alit at Broadway-Lafayette. By 5:30 the train had not arrived, and more and more people filled the platform. Another D arrived, the one I’m usually on, discharging more people. Seven minutes later another D arrived. The platform was getting really crowded. No announcements were made. Yet another D train came at 10 minutes to 6, and I thought about walking the 10 blocks to Avenue A. But the hope that the F would finally arrive kept me glued to the platform. I could hear a constant stream of announcements from the 6 train platform at the end of the station, but there were no announcements on our platform. 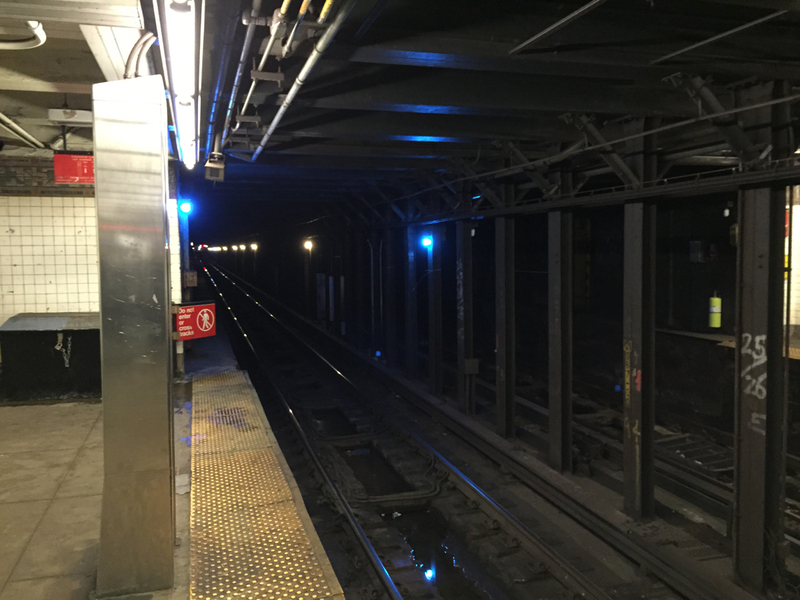 On the other side, the uptown side, the D and F trains arrived on schedule, every 7 minutes. By this time I had finished the crossword and had nothing left to do except to time the trains that did arrive. At 6PM I decided to walk. This train wasn’t coming anytime soon. As I reached the stairs at the end of the platform, I passed two transit workers who’d been waiting for the F and overheard them talking. One of them had a radio. Too bad they didn’t share this information with all of the other people on the platform. As I walked up the stairs, I could here the announcement that was being made on the 6 platforms. If there had been a way to push the whole NYC Transit system in front of a train at that point, I would have done it. Yesterday I was coming home from a job in Park Slope on the B train. The plan was to switch to an A train at 59th Street if there was one in the platform, otherwise stay on till 145th and either switch to a C train which puts me one block closer to home, or walk. If I got an A I might overtake a C train and get home faster at best, and at least I wouldn’t have to walk up the stairs at 145th Street to change for a C train. 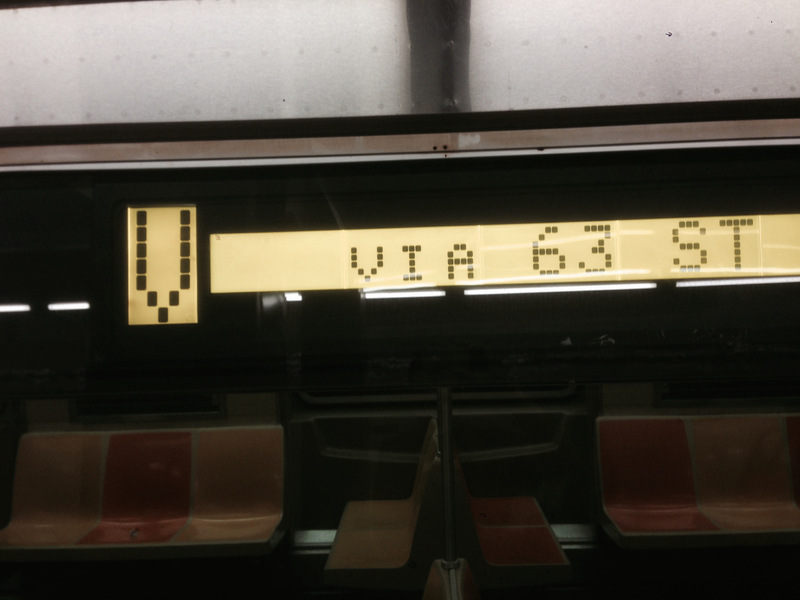 The train pulled into 59th Street; I was making good time. No A train, so I remained seated. Just as the doors closed, an A pulled in. Damn! Maybe the doors would open again. But they didn’t. As my train pulled into 125th Street there was an A train with the doors open on the platform. I got up and got ready to bolt across the platform, praying for those doors to stay open. Our doors opened and with dozens of others I bolted the 20 feet or so to the open A train doors and got on. It was crowded and I had to stand, but that was OK because I was only going one stop, it would take three minutes at the most. The B train doors closed and it left the station, and my heart sank. I realized the A train wasn’t going anywhere. I peeked to the end of the platform to see if the light was green or red, and it was green. So what was the problem? NYC transit did not let us know. I waited, and waited. I was seething again. Four separate times in March the A and C trains were delayed or suspended because of “a rail condition,” whatever that means. And I’m not talking about 10 or 20 minute delays, I’m talking about total I was an hour late delays. The fare’s gone up and the service gets worse. I have a picture somewhere of track workers working on a track in front of my window when I lived on Flushing Avenue in Williamsburg. There was one guy on his knees doing the work, and six guys who just stood there and watched. And you know these guys were clocking big bucks, it’s “skilled labor” and it was a Sunday. I wish I could make big bucks watching someone else sweat. There’s something wrong with this picture. 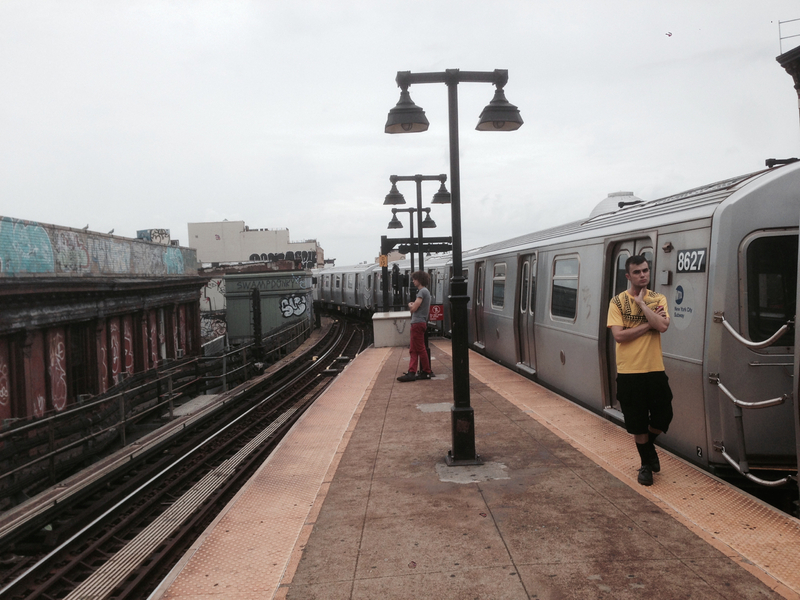 This train was stalled at the Myrtle Ave station in Bushwick for a half hour last summer. So yesterday, after standing on that A train for 10 minutes or so with nary a word from the crew or any announcement over the station P.A. system, the doors closed and we pulled into the tunnel. We’d barely gotten out of the station when the train stopped for another 10 minutes. It continued to 145th street like that, in fits and starts, turning a 3 minute-trip into a 28-minute trip. Yes, I kept looking at my watch. Again, not a peep from the crew. When I got off at 145th, I hoped against hope a C train would be approaching, and that’s when I heard the first announcement. “After an earlier incident, uptown A and C trains are now running with delays…” I went up the stairs and walked home. 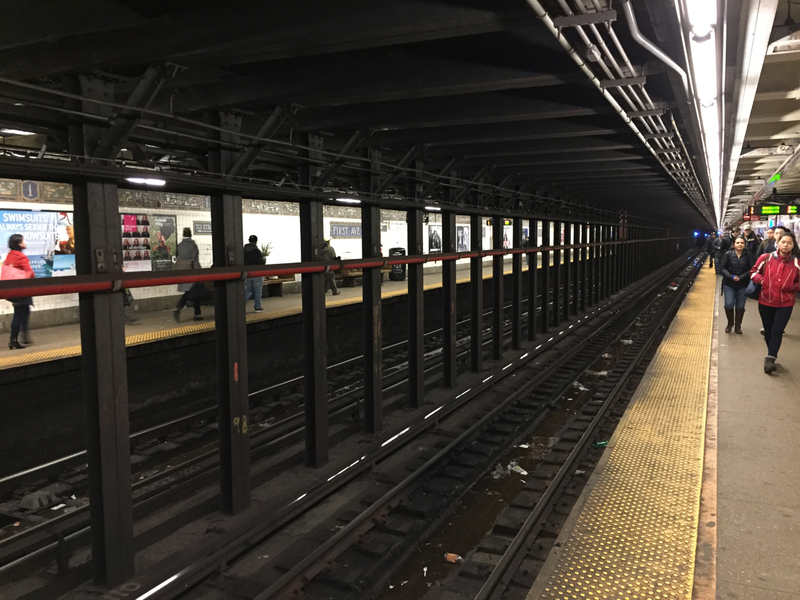 This entry was posted in Uncategorized and tagged anger, anxiety, frustration, inefficiancy, MTA, New York City life, NYC transit, powerlessness, rail condition, subway announcements, subway delays, subways, waiting for the train. Bookmark the permalink.